Sing that title like the song by the O’Jays. What!?! You don’t know who the O’Jays are?!? Don’t worry, neither did I. Just think of The Apprentice theme song. What?!?! You didn’t watch that show at least once!?!? We can’t be friends anymore. Especially if you didn’t watch the season with Gary Busey or La Toya Jackson! P.S. I’m really sad I missed out on the most recent season with both of them in it. I can only imagine the crazy that went on! I will definitely be downloading and watching it! Any who, if you still don’t know what I’m talking about, here. But seriously, shame on you! This week’s picture is all about money because it has definitely been one of our biggest struggles so far on this trip. Changing currencies every week or two is really stretching this weird part of our brain that we didn’t have to use back in the U.S. We started off in Japan where it seemed to be the easiest conversion, 100 JPY = about $1. But then we went to the Philippines where 42 PHP (Philippine Pesos….that in itself was confusing because we were in the Philippines not Mexico!) = about $1. So we rounded up to 50 = about $1. Then Singapore where 1.26 SGD = $1. Now even more rounding was being done, up or down depending on how much we wanted something and wanted to pretend like it was cheaper. Don’t even get me started on Indonesia. 10,000 IDR = about $1 which means when we went to the ATM to get $100 we had to take out 1 Million IDR! So weird! But actually, that was pretty cool because we felt like we were making it rain all over Bali! And now we are in Malaysia where 3 MYR = about $1 and I have to remember that song I learned in elementary school when I learned how to multiply by 3, except I have to divide by 3 so that’s already like 100 steps to figure out how much that Big Mac at McDonalds really is. Another obstacle in all of this is that sometimes bills have equivalent coins. I have a paper bill that says 20 and I have a coin that says 20, so is that cents or are they equal?! There was a time we actually held out a handful of money to a teller and let her pick out the money we owed. Luckily, most people we have come in contact with on this trip have been nice so I have high hopes that we didn’t help her rip us off. Basically, we have both learned from this money adventure that we are really bad at math. Thank gawd you have a college education! I can only imagine how confusing that must all be! Last year Andrew and I went to Paris, London & Sweden, each of which uses different money, and it was SO CONFUSING. We had friends in Sweden, so I don’t think we ever actually figured out the conversion there. 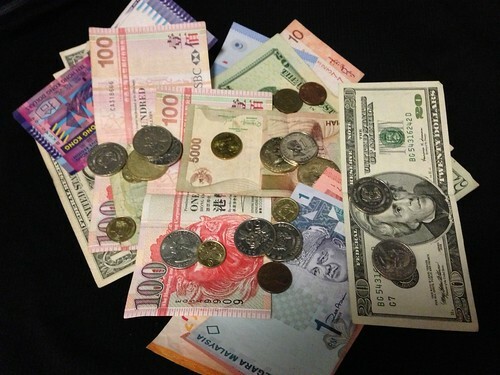 In just this last week we went through 3 different currencies! Brain = fried.